So where do you want to go tomorrow? That's the question Bill Gates tries to answer in Business @ the Speed of Thought. Gates offers a 12-step program for companies wanting to do business in the next millennium. The book's premise: Thanks to technology, the speed of business is accelerating at an ever-increasing rate, and to survive, it must develop an infrastructure--a "digital nervous system"--that allows for the unfettered movement of information inside a company. Gates writes that "The most meaningful way to differentiate your company from your competition ... is to do an outstanding job with information.How you gather, manage, and use information will determine whether you win or lose." The book is peppered with examples of companies that have already successfully engineered information networks to manage inventory, sales, and customer relationships better. The examples run from Coca-Cola's ability to download sales data from vending machines to Microsoft's own internal practices, such as its reliance on e-mail for company-wide communication and the conversion of most paper processes to digital ones (an assertion that seems somewhat at odds with the now-infamous "by hand on sheets of paper" method of tracking profits that was revealed during Microsoft's antitrust trial). While Gates breaks no new ground--dozens of authors have been writing about competing on a digital playing field for some time, among them Carl Shapiro and Hal Varian in Information Rules and Patricia Seybold in Customers.com--businesses that want a wakeup call may find this book a ringer. With excerpts inTime magazine, a dedicated Web site, and an all-out media assault, Microsoft is working hard to push Business @ the Speed of Thought into the national dialogue, and for many it will be difficult to see the book as anything but a finely tuned marketing campaign for the forthcoming versions of Windows NT and MS Office. 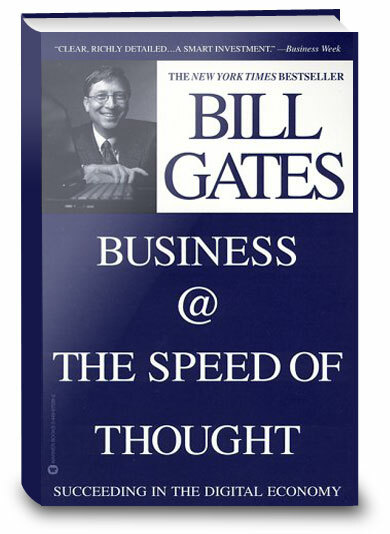 Nevertheless, as Gates has shown time and time again, him, Microsoft, and perhaps even this book you may ignore at your own peril. --Harry C. Edwards --This text refers to the Hardcover edition. Click the button below to add the Business at the Speed of Thought to your wish list.